"Troops of 145 Bn in Damasak, Borno State are engaging Boko Haram Terrorists who came to attack their location at about 6 p.m. this evening. Fierce battle on going right now. 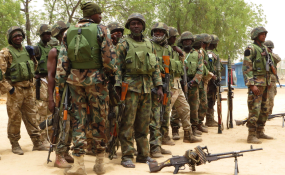 The troops are dealing with the terrorists," Mr Chukwu, a brigadier general, said.